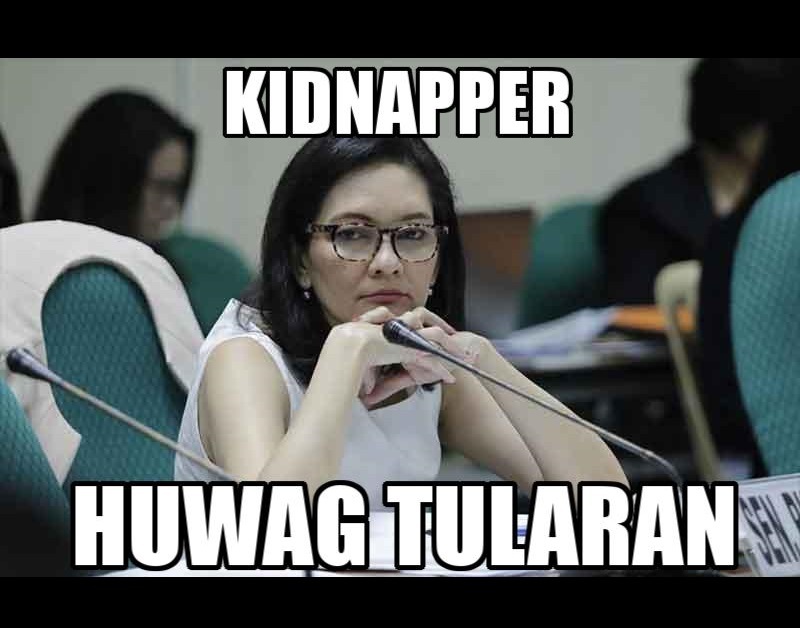 Thinking Pinoy: The Kidnapper-Senator Risa Hontiveros? Senator Risa Hontiveros took custody of the three witnesses — 31-year-old and two minors aged 16 and 13 years old — since Sunday (August 20) [MB], without authorization from the minors’ parents and/or legal guardians. Some camps argue that Senator Hontiveros and her accomplices may be liable for violating Article 267 of the Revised Penal Code, which covers Kidnapping and Serious Illegal Detention, so let’s see if she can indeed be sued for it. I consulted my lawyer-friends and MyLegalWhiz.com for the preparation of this article. That the offender is a private individual. That he kidnaps or detains another, or in any other manner deprives the latter of his liberty. That the act of detention or kidnapping must be illegal. That the person kidnapped or detained is a minor, female, or a public officer. Element 1: That Risa is a private individual. Yesterday, PAO Chief Persida Acosta called out Senator Risa Hontiveros for refusing to turn over the underage witnesses, despite the fact that it’s PAO, along with NBI, DOJ, and PNP, that has the mandate to protect them [GMA]. If the offender is a public officer, the crime committed would be arbitrary detention, but the public officer must have a duty under the law to detain a person. Since senators have no duty to detain or take custody witnesses (only PAO, NBI, DOJ, and PNP has such authority), Senator Hontiveros shall be prosecuted as a private individual. This fulfills the first element. Translation: Actually, I wasn’t informed. That’s wrong. That’s foul. Before they take custody of my child, they should asked permission from me, if I will agree to give their side custody of my child. First and foremost is that Hontiveros, I haven’t spoken to her. She didn’t even find a way to contact the mother of the witness despite the witness being a minor. The fact that Risa did not secure consent from the parents means she kidnapped these underage witnesses. This fulfills the second element. The DOJ is the sole implementor of the Witness Protection Act [RA 6981]. Although the DOJ may call upon other executive agencies to implement the law, what’s clear is that the Senate is not an executive agency. That is, the Senate – along with any or all the Senators – have no legal authority to take protective custody of witnesses. Now, it may be argued that the minors – aged 16 and 13 – agreed or even volunteered to be taken into Hontiveros’ custody. However, parental consent is required in cases like these, something that Hontiveros failed to secure, as shown in the TV Patrol interview cited in the previous section. Art. 271. Inducing a minor to abandon his home. — The penalty of prision correccional and a fine not exceeding seven hundred pesos shall be imposed upon anyone who shall induce a minor to abandon the home of his parents or guardians or the persons entrusted with his custody. Hence, the detention of the minors, even if supposedly protective in nature, is illegal. This fulfills the third element. (d) That the person kidnapped or detained is a minor, female, or a public officer. Hontiveros clearly simulated the authority of PAO, NBI, DOJ, and/or PNP, thereby fulfilling the second condition. Moreover, the persons kidnapped are two minors, fulfilling the fourth condition. Now, the fourth element requires the presence of ANY of the circumstances enumerated, so the presence of (b) and (d) is more than enough. Suffice it to say, this fulfills the fourth element. In short, Senator Risa Hontiveros can be sued – and will very likely be convicted – for kidnapping and serious illegal detention of the two minors. The overeager Hontiveros, blinded by political ambition, committed kidnapping and serious illegal detention that is punishable by reclusion perpetua [Gov], i.e. 30-year prison term. Note that she took custody of TWO minors, so she may even be found guilty of TWO COUNTS of kidnapping and serious illegal detention, translating to up to 60 years in prison. Hontiveros also violated Article 271 or inducing minors to abandon their home, where the penalty is imprisonment ranging from six months to six years. Again, she may be guilty of TWO counts. Hontiveros also committed Obstruction of Justice [P.D. 1829], as she prevented witnesses from reporting the commission of any offense or the identity of any offender/s by means of force, in light of her having kidnapped the underage witnesses and PAO Chief Acosta having to call her out for refusing to turn over the same. Again, she may be guilty of TWO (or even up to three) counts. The penalty is imprisonment ranging from six months to six years per count. With these said, Hontiveros faces the prospect of having to stay for up to 90 years behind bars. For Obstruction of Justice, the DOJ, PAO, NBI, or PNP can sue her. As for  kidnapping serious illegal detention and  inducing a minor to abandon his home, any parent or household member can sue Senator Hontiveros. However, anybody who has personal knowledge of the commission of the offense may also file a case. Since Hontiveros was stupid enough to broadcast her deeds on national TV, everyone can be presumed to have personal knowledge, i.e. VIRTUALLY ANYONE CAN SUE HER. Moreover, since the two witnesses are minors and no legal guardian has come forward, the concept of parens patriae (parent of the nation) applies. Concerning the protection of minors, the State's role as parens patriae burdens it with “the duty of protecting the rights of persons or individual who because of age or incapacity are in an unfavorable position, vis-a-vis other parties. Unable as they are to take due care of what concerns them, they have the political community to look after their welfare. The prerogative of parens patriae is inherent in the supreme power of every State and is often necessary to be exercised in the interest of humanity and for the prevention of injury to those who cannot protect themselves. That is, should a parent or household member of the underage witnesses fail to file a case, the Department of Justice (DoJ) or even the Department of Social Welfare and Development (DSWD), can file a case instead, a case that is very likely to send the overeager Senator to jail. Note that I have notified the DSWD of this issue and they're looking into the matter right now.